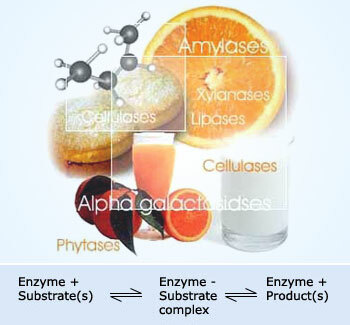 Enzymes react with substrates to give products A substrate is a molecule upon which an enzyme acts. Enzymes catalyze chemical reactions involving the substrate. In the case of a single substrate, the substrate binds with the enzyme active site, and an enzyme-substrate complex is formed. Enzymes make possible all the biochemical reactions proceed at very high rates even under mild conditions of temperature and pH characteristic of living organism. To effect biochemical reactions, very powerful catalysts are needed. These essential biological catalysts are collectively known as enzymes. Without them, the living process would be too slow to sustain life. In fact, the human body would not exist without enzymes because the chemical reactions required to maintain the body simply would not occur fast enough. For example, just think about the juice you drank few moments ago before reading the magazine. The sugar in the juice was converted to CO2, H2O, and chemical energy within seconds of being absorbed by our cells, and this chemical energy enabled us to see, think, and move. However, the 2.2-kilogram (5-pound) bag of sugar in our kitchen cabinet can sit for years and still not be converted to CO2 and H2O. Thus, the human body speeds the overall reaction through a series of enzyme-mediated steps. The key is in the catalytic power of enzymes to drive reactions on a time scale required to digest food, relay signals via the nervous system, and contract muscles. To date, more than 3000 enzymes have been identified and they constitute the largest and most highly specialized class of proteins. Enzymes digest, or break up the food They are the biological catalysts speeding up the break−down of the different components of foods on a chemical level. Here are a few examples and what they do. They speed up reactions upto ten million times compared to the uncatalyzed reactions. They are specific in their action on substrates (molecules on which they act) and each enzyme catalyzes only a specific type of reaction. They are active at moderate temperature and pH. The actions of enzymes are controlled by various mechanisms and are inhibited by various organic and inorganic molecules. Even small amounts of enzymes can be highly efficient. This is because the enzyme molecules are regenerated during their catalytic activity, just as chemical catalysts. A typical enzyme molecule may be regenerated million times in one minute. An example is the enzyme "renin" which is used in cheese making. It coagulates over a million times of its own weight of milk protein. In addition to the protein structure, most active enzymes are associated with some non−protein components required for their activity. These could be metal ions and smaller organic molecules called coenzymes. Some of the metal ions involved are Zn, Mg, Mn, Fe, Cu, K and Na. Many of the coenzymes are derived from vitamins. Example to show enzyme catalysis The enzyme sucrase catalyzes the hydrolysis of the disaccharide sucrose into its two monosaccharides, glucose and fructose. The reactant an enzyme acts on is referred to as the enzyme’s substrate. The enzyme binds to its substrate (or substrates, when there are two or more reactants), forming an enzyme−substrate complex. While enzyme and substrate are joined, the catalytic action of the enzyme converts the substrate to the product (or products) of the reaction. 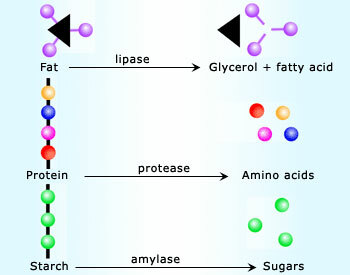 The overall process can be summarized as follows: For example, the enzyme sucrase (most enzyme names end in −ase) catalyzes the hydrolysis of the disaccharide sucrose into its two monosaccharides, glucose and fructose. First, the reactant molecule or molecules (substrate) bind to a region on the surface of the enzyme called the "active site ". The active site of a given enzyme is so shaped that only its specific substrates fit into it, just as only one key opens a certain lock. This specific binding resulting in an enzyme−substrate complex accounts for the high specificity of the enzymatic reactions. In this complex, the substrate is placed in the right orientation to facilitate a given reaction, thus enhancing the rate of the reaction. Enzymes function by lowering the activation energy (EA) of a particular reaction. Thus, in a very simple sense, a biological cell is a membrane-bond sack filled with molecular shapes interacting in an aqueous fluid. As a result of the magnificent internal organization of cells, many complex processes in an organism begin when a molecular key fits into a correspondingly shaped molecular lock. It all depends on the molecular shape of the molecules. Enzyme use in food production Enzymes extracted from edible plants and the tissues of food animals, as well as those produced by microorganisms (bacteria, yeasts, and fungi), have been used for centuries in food manufacturing. 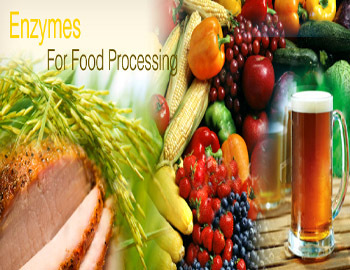 Enzymes have useful applications in industry. Chief among these are their use in fermentation processes to manufacture beer and wine and in food industry for generation of sweet syrups from cornstarch and in cheese production. With time, research, and improved protein engineering methods, many enzymes have been genetically modified to be more effective at the desired temperatures, pH, or under other manufacturing conditions that are typically inhibitory to enzyme activity (eg. harsh chemicals). It makes them more suitable and efficient for industrial or home applications. Historically, humans have been using enzymes for centuries, in early biotechnological practices to produce foods, without really knowing it. It was possible to make wine, beer, vinegar and cheeses, for example, because of the enzymes in the yeasts and bacteria that were utilized. Biotechnology has made it possible to isolate and characterize the specific enzymes responsible for these processes. It has allowed the development of specialized strains for specific uses that improve the flavor and quality of each product. Enzymes can also be used to make the process cheaper and more predictable, so a quality product is ensured with every batch brewed. Other enzymes reduce the length of time required for aging, help clarify or stabilize the product, or help control alcohol and sugar contents.